"The Coming of the Supermen" - Part 5: "Strangers in a Strange Land!" Granny Goodness has Rafi tied to a machine by some webbing like cables. A boomtube opens and Apokolitian soldiers fall out of it, followed by an angry Superman screaming out "Rafi". Following Superman is Orion, and together the two heroes make short work of the Apokolitian soldiers. Superman burst through to Granny Goodness' lab to where she and Rafi are... Granny warns Superman if he attempts to rescue Rafi, the boy will surely die... Just then Granny is struck from behind, knocking her out, by Lois Lane, who had been making her way to Granny's lab also. Superman frees Rafi, only for Kalibak to attack... but he is instantly stopped in his tracks by two surprise entrants, Mr Miracle and Big Barda. It turns out that, Barda and Miracle had made contact with Rafi earlier, and they were waiting for the opportune moment to strike. After some talking, we learn that New Krypton is big enough to not only house the Kryptonians, but Apokolips and New Genesis citizens also, but it is Darkseid's desire to conquer that prevents it all from happening. Metron arrives sitting atop his infamous Mobius Chair, helping Apokoliptian refugees escape Apokolips' side of the planet. After some talking, Superman leaves Rafi in the care of Mr Miracle and Barda, however Lois insists on coming with... The mysterious Messenger turns up, says something cryptic, and Superman flies off. Story - 3: I just want to put it out there, that Superman has his trunks in this issue and in this entire series... Though the belt is different... But the trunks are there! (Just a little inside joke for the regulars on the Superman Homepage). It is as the last 5 issues... This is a complicated and confusing read, but it's fun in a zany kind of way! Again, the downfall is mostly due to the dialogue... confusing as I've stated before, but also misleading and not properly structured... We can't blame Adams for it alone; this book has 2 editors... Surely one of them could make suggestions or explain to Adams that it's just not working in places. Big Barda and Mr Miracle turning up... Out of the blue was a major surprise... But you know what, I actually loved it, because just last issue, I was wondering, that it was odd that they and Metron haven't even been referenced. I loved seeing them. And one thing with them showing up and revealing that they had already met with Rafi, led me to the conclusion that there was more going on in this story, behind the scenes... I found it to be rather epic. The scene of Superman taking on all the Apokoliptian soldiers was awesome... Remember, he is depowered from last issue, no stronger than the Supermen that arrived on Earth. Yet still, a side of Superman is shown, a certain bad @$$ quality which is an awesome change from the last few years... Let's take note, that this may be a side effect of Superman having the trunks! Like many Superman fans, I enjoy all eras of the character, and even though I favor the Post-Crisis Superman more, I like this obvious Bronze Age tale of Superman in a modern setting! I loved the literal pick up from the last issue, and hope that the cliff-hanger we were left on this issue, is picked up in the next. Darkseid disintegrated Luthor...Not something I expected... But couldn't have happened to a better character! I love when bad things happen to bad people, something very poetic about that! Lastly, I know I said that the dialogue was and has remained... Odd... But I like the little touches, like Rafi calling Superman Kal-El, and Superman calling him "son", when he rescues him from Granny Goodness... It showed me that these two have a special bond; it was rather sweet and touching. Something you'd expect from Superman's character. I'm looking forward to this series concluding next issue; however, we still have many unanswered questions... Darkseid's father, and his connection to the Sphinx in Egypt. The Messenger and his real purpose in all this... The orange spot in the sun and its implications on Superman in the future. 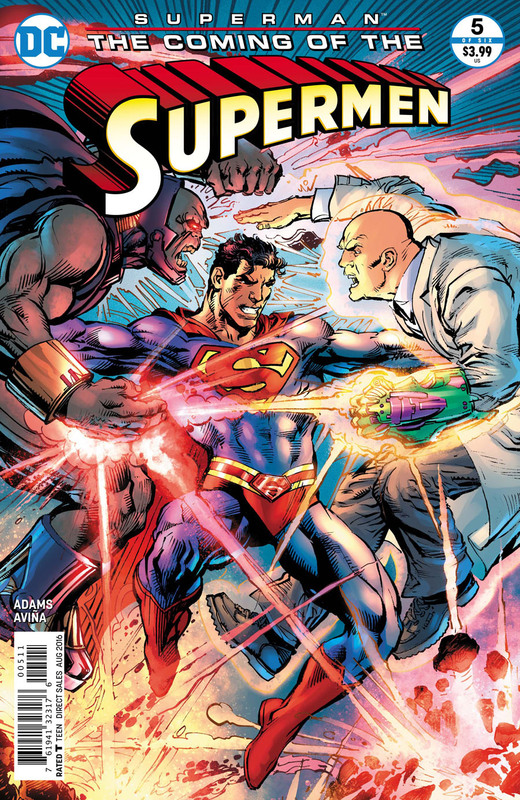 Lastly, what about Luthor's fate? Art - 5: Neal Adams put Superman back in the trunks! Just reminding y'all about the "epicness" (yes I made up a word) of the trunks! Adams storytelling is definitely done more through the art. Every page is laid out to the best way it can, and the story flow is smooth, and hits you with a bang during the action scenes. It is very cinematic. No one is better at laying out a page, than Neal Adams. It has been a true pleasure as an Adams fan to review this book. Page 2. The look of fear on the Apokoliptian soldiers and the angry fierce look on Superman's face as he shouts Rafi's name, as he flies through the boomtube behind them. Page 8. Superman rescuing Rafi. The look of joy in both their eyes, and the smile on both their faces. Page 16. The way Rafi has both hands behind his back, as he's leaning forward looking at the Supermen, as Superman talks with the 3 of them. Mr Miracle is doing this also. Whilst we are reminded that Barda is taller than Mr Miracle, as she towers over him. Page 19. Superman and Lois sharing a kiss. Superman hunching down, and Lois on her tip toes with her arms around the back of his neck. Page 20, Superman takes flight, backwards, while still addressing Lois as he leaves her behind. This pose reminded me of the awesome shot from superman Returns, where he is taking care of the damage that Lex Luthor's island is causing on Metropolis, as Superman turns back in mid-flight to burn the broken glass that is about to fall on the innocent bystanders on the streets. It is truly amazing artwork, and again I'm grateful I had a chance to review this book. Tony Avina's coloring continues to impress... I can't say much more. He is on the same calibre as Alex Sinclair to me. Also I'm stoked that a colorist gets credit on the cover... Finally! Absolutely last note... Just want everyone to know... Superman is wearing trunks! Cover Art - 4: Adams and Alex Sinclair again get the credit for the cover this issue. The cover composition is great, and has a yesteryear feel to its layout. Superman seems to be floating in between Darkseid and Luthor... Maybe not having his full figure may have worked more... But at least he's wearing trunks!